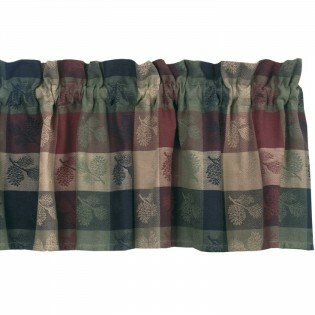 This cabin pine cone valance will brighten up any window in your home. 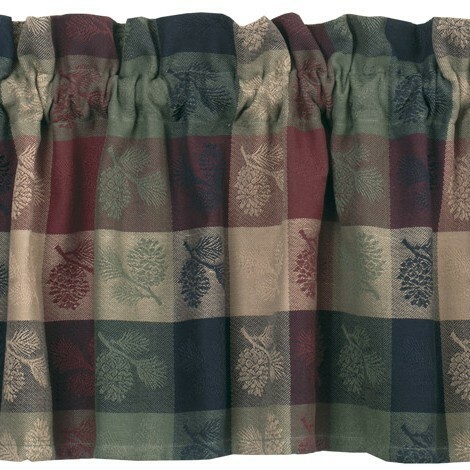 The High Country Pine Cone Valance has a woven jacquard pine cone design placed on squares of sage green, burgundy, navy and camel. This cabin pine cone valance will brighten up any window in your home. The High Country Pine Cone Valance has a woven jacquard pine cone design placed on squares of sage green, burgundy, navy and camel. Made of 100% cotton. Ships in approx 1-3 business days.